The use of tools within a modern robotic process system: the applicational experience of SIR Sistemi Industriali Robotizzati in high-flexibility cutting and trimming operations. During the last decade, the growth in the use of industrial robotics has been considerable, especially in non-traditional industries and applications, with the use of high value-added solutions. 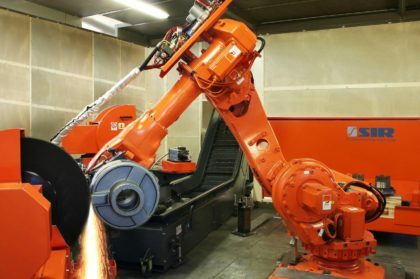 Automation is blooming in the foundry sector in particular: where once robots were relegated to simple tending tasks at all levels, now their use is being extended, with ever-growing success, to genuine process applications, such as cutting, trimming, bevelling, grinding, polishing and buffing. SIR Sistemi Industriali Robotizzati, one of the top international system integrators, has been involved in this sector’s evolution for years, delivering state-of-the-art solutions not only in iron and aluminium foundries but also in plants which process brass and other alloys. In these cases, the integrator is called upon not merely to design the mechanical and electronic solutions and build and program the plant: if the automation is to be successful, it must have practical know-how and specific knowledge of the machining processes and the techniques by which the tools are used. This last factor, in particular, is crucial for achievement of the quality required. It is therefore extremely important for the integrator, working closely with the end customer with in-depth knowledge of the individual application, to choose the right tools and, in the final analysis, to know how to use them correctly within the context automated. The impressive know-how built up in more than twenty years in top-level robotics and its countless applications for finishing procedures have given SIR considerable experience with regard to tooling. Nowadays, depending on the procedures performed and the material processed, SIR systems are equipped with diamond and resin wheels, diamond discs, circular or band saws, hard alloy or ceramic-coated face cutters, brushes, sanding belts and sisal and cotton buffing wheels. Resin or diamond grinding wheels, in particular, are very important in trimming operations. Resin-bonded wheels are generally used for the removal of large amounts of material, or for machining particularly hard special steels, such as those with high chromium content. They are inexpensive, but they have a number of drawbacks to be borne in mind when designing and using a robotic system: first and foremost, the wheel’s diameter does not remain constant throughout the process, so the tool requires constant refreshing, which alters its profile. The manipulation of the objects in contact with the wheel also requires special care, since any programming or approach errors, causing collisions with the tool, may cause breakages and explosions, hazardous for both the equipment and the operator, if any. Diamond wheels are unaffected by this problem and have a longer lifetime, which is in any case proportionate to their cost, generally four times that of resin wheels. 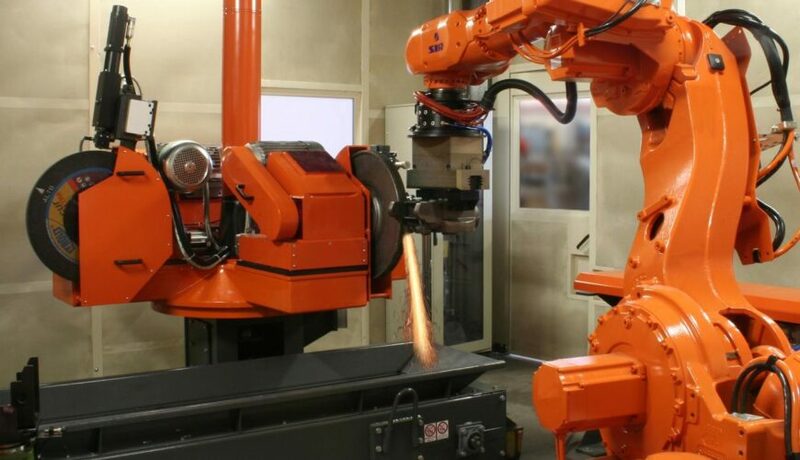 Since the diameter and profile are constant over time, refreshing is not necessary and this has been the key to the success of diamond wheels in robotic applications, as the system does not have to include tools and equipment to restore the profile and continually correct the machining program. However, diamond wheels can only be applied when machining materials which are not excessively hard, and for removing small and medium quantities of burr. So basically there are two general categories of use, and the choice between resin or diamond depends on the type and amount of material to be removed. Just like cutting discs, grinding wheels, whatever their type, must be used with the correct machining parameters, especially rpm and robot feed speed. For a clearer understanding of how grinding wheels and other tools are used in SIR systems, we need to take a closer look at the context, meaning the layout and operation of one of the company’s typical process applications, which encapsulates the know-how and experience built up in so many years of top-level system integration. In the majority of installations, the piece is manipulated by the articulated robot and machined by tools installed inside its operating area. Configurations of this kind are more rational and provide higher productivity than layouts where the piece is mounted on a fixed station and the tools are on board the robot, since the piece can be picked by the tending system and processed directly, with no need for intermediate placing and chuck changing operations. In general, all sides of the piece can be machined with the aid of suitable grip changing units, and the transition from one tool to the next is very quick, with an impressive reduction in passive handling times. Since the piece is supported by the robot, there is no need for complicated equipment to support it and rotate it to present the correct face for machining, reducing the cost of the system and cutting tooling times when the piece type changes. Moreover, as they are not installed on the robot, the tools can be of very large size and rotate at exceptionally high speeds without applying excessive dynamic loads to the robot itself. It is obvious that a layout of this kind delivers greater flexibility with a shorter cycle time and higher quality, more reproducible machining. However, SIR has gone even further, implementing a solution that has superseded the traditional radial arrangement of the tools within the robot’s working area. 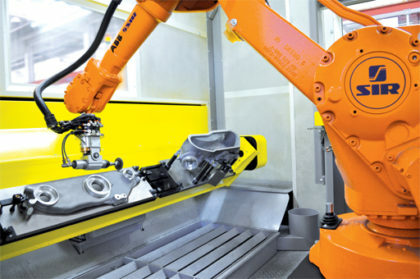 Profile modular trimming, cutting and finishing systems, generally used for machining cast iron and aluminium, feature an outstanding unit that assists the robot during the machining processes: the Module. Recently patented, the Module consists of a universal machining unit which can be customised to individual needs, comprising a structure rotating on an axis controlled by the robot itself. The Module is able to take four or more interchangeable stations, equipped with tools and positioned in turn in the working area facing the robot, and is available in standard configurations for cast iron and aluminium industry applications. In the first case, for example, the Module typically accommodates a grinder and a cutting disc with axial compensation, combined with 2 milling units with multi-directional compensation. Each station is able to take one or two spindles which can tilt to up to 90° for undercutting; however, the system’s modular design means that every configuration can be customised to requirements. For aluminium machining, the Module is equipped with a circular saw or a bandsaw, one or two new-concept vertical belt-polishing machines featuring pendulum compensation with high adjustment sensitivity, and a milling cutter or a pneumatic spindle with radial compensation. And this compact layout (space requirement of 34 to 45 m2) goes hand-in-hand with impressively easy internal access and cleaning, with high working environment quality: an extraction system prevents the build-up of hazardous dusts which could trigger fires or explosions, especially when machining aluminium or magnesium. Moreover, a variety of tending systems are installed around the robot itself, the main player which reproduces the work of the skilled trimmer or miller. They may include a standard blank feeding table with universal tops with the piece resting positions identified by the new, patented VistaVision® system. Finished pieces may be discharged into bins standing on a second turntable or by means of a removal belt. The 2/3 jaw grippers, complete with automatic pickup/release modules, are housed in a new-concept magazine, while end-effector change stations and additional vision systems can also be added to give this small factory-within-a-factory even better production logistics. Last but not least, if resin wheels are used, the system is equipped with automatic wheel refreshing systems specifically designed and built by SIR to restore the wheel to the correct form. Obviously, this operation is fairly lengthy and the time required cannot always be covered by other operations, so in this case productivity may be lower. Moreover, if the wheel’s shape changes, the robot coordinates of the various programmed points must be automatically adjusted. Although the Profile system is the ideal solution, there is an alternative, which however is much less widely used. 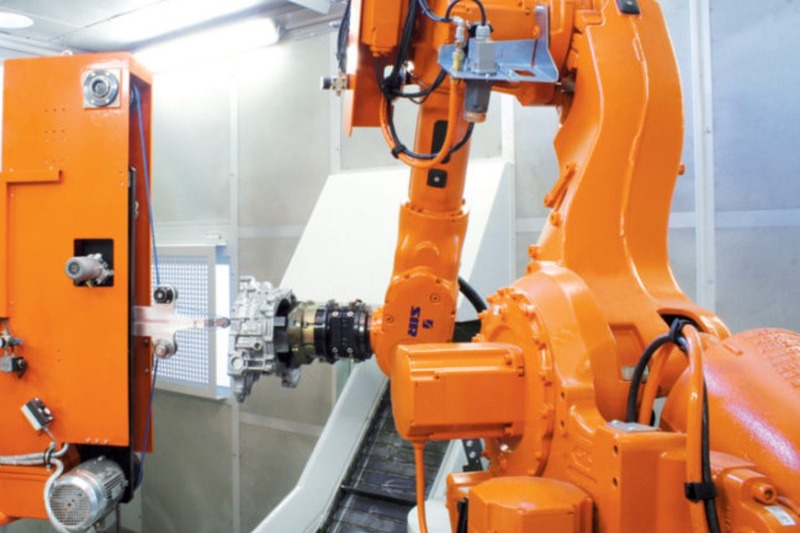 In it, the tools are manipulated by the robot while the workpiece is in a fixed position or mounted on special rotating and swinging fixtures; systems of this kind have higher overall cycle costs and longer cycle and tooling times. Obviously, since they are fitted on the robot the tools cannot be excessively large, and there are also limits on their power drawdown: grinding wheels therefore have to be avoided in favour of small-diameter cutting discs, belt sanders and flap wheels. SIR systems built with this configuration use tools with automatic connection/release modules, housed in suitable magazines. The electric spindles themselves are fitted with automatic tool change systems, with short startup times to minimise the total cycle time. Obviously, solutions with tools on board the robot are only preferable when processing very large, heavy pieces, or items which are problematic to grip. But is there a third configuration, capable of combining the benefits of both solutions? The answer is a resounding yes, and SIR has already built and patented it. 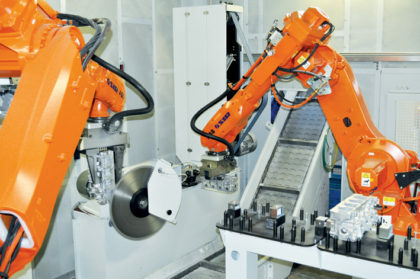 It comprises a Module unit capable of using dozens of different tools, which can be automatically replaced in times covered by robot machining operations, in response to both type changes and wear. So this idea delivers outstanding flexibility and opens out new development horizons for foundry process automation. As already mentioned when describing the Module, the tools used in SIR systems are equipped with passive mechanical compensation devices: the problem of variability within production lots is thus eliminated by introducing tools capable of adapting to profiles that diverge from the nominal form. Basically, the fixed or movable machining units have degrees of freedom that enable them to maintain the contact force between the tool and the component constant even if the thickness of the machining allowance varies. The constant force on the contact surface increases the specific pressure when the tool encounters irregular projecting parts such as burrs or die joint ridges, giving it the added removal power needed for their total removal. These devices allow the achievement of high finishing quality and excellent reproducibility even with casting and pressing errors, variable burr sizes and imprecise programming. Compensation is the key to process applications: top quality trimming, grinding and polishing operations are not possible with a rigidly held tool. 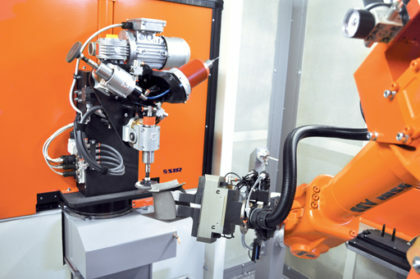 Generally mono-directional, right-angled bidirectional or omnidirectional, passive compensation allows the contact force to be automatically controlled by the robot program, ensuring constant adaptation even with different machining modes. 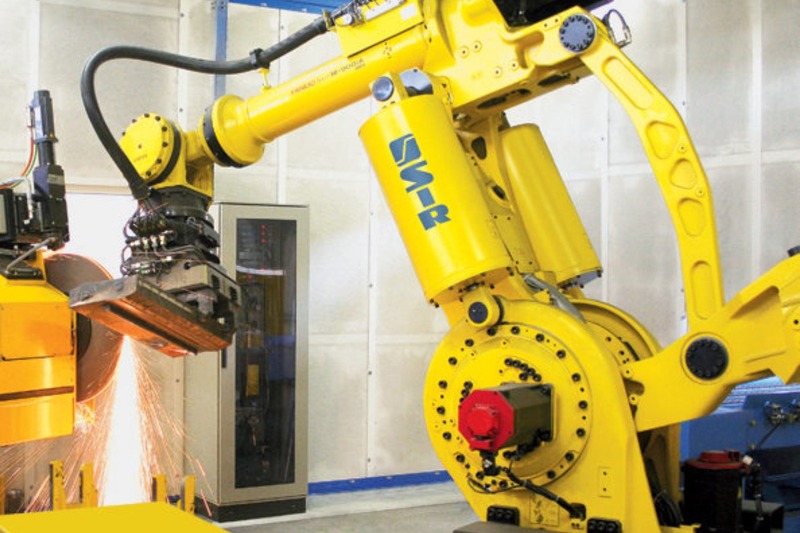 Moreover, latest-generation SIR systems use active compensation, with special sensors installed on the robot to measure the intensity and direction of the forces present during machining. In this case, the use of a software capable of adjusting the robot’s behaviour on the feedback principle with a sensor polling time of a few milliseconds considerably improves quality and reproducibility, optimising the cycle time, simplifying programming procedures and, last but not least, reducing the risk of damage. To make the best possible use of tools’ potential, systems must be programmed as accurately as possible. The approach to grinding wheels, in particular, must be safe and correct to avoid the risk of tool damage or the expulsion of sparks at very high temperatures towards the robot, which could potentially start fires in wiring and festoons. When using cutting discs, the approach must be calculated so that the weight of the riser or feed head tends to open the cut produced. These simple measures can make all the difference between a safe machining process or a hazardous or flawed application: even compensation itself will not provide all its sensitivity unless clearly defined rules are applied. In order to be accurate, the machining program must be built around the ideal workpiece. To allow this, SIR equips its process systems with virtual simulation and off-line programming tools based on the 3D mathematical drawing of the pieces, with contact digitisers of appropriate size. These systems allow the robot to be programmed precisely from the comfort of the office, without shutting down the real production plant, with advance warning of critical features and cycle times and impressive savings on start-up times. The problems in aligning the real and virtual worlds, due to the geometry and variability of pieces and picking positions, are resolved by using contact sensors within the system or thanks to the three-dimensional synchronisation potential of the new VistaVision® vision system, which ensures quick final tuning of the program. Basically, SIR offers a global vision in which the achievement of a constant, reproducible high quality result requires the correct use of specially chosen tools, assisted by different operating devices, modes and strategies. The intensive integration of various systems within a single solution is fundamental for the realisation of a modern process system which can truly be described as intelligent.